The Mac gives you control over how your printer will behave and how your prints will look. You can customize your printouts by adding borders, creating two-sided prints, scheduling a delayed printing, color matching, adjusting print quality, and more. 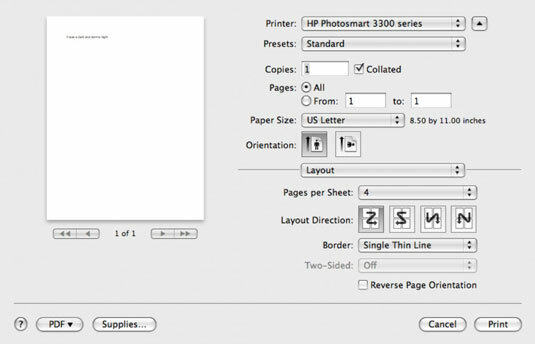 Layout: You can select the number of “pages” that will get printed on a single sheet of paper and determine the ways those pages will be laid out. You can choose a page border (Single Thin Line, Double Hairline, and so on) or turn two-sided printing on or off, provided your printer can handle such a task. Scheduler: Suppose you have to print dozens of invitations for your spouse’s surprise birthday party and want to print them when no one is in the house. Set your Mac to print at a later time. Paper Handling: Print only odd- or even-numbered pages or print pages in reverse order. You can also scale a page so that it fits a legal- or letter-sized sheet, an envelope, or a variety of other paper sizes. Color Matching: Choose this setting to select ColorSync Profiles (from Apple and others) so that you can match the color on the screen to the color you’re printing. Cover Page: Print a cover sheet stating that everything else you’re printing is classified or confidential. Paper Type/Quality: Clues the printer in on the type of paper you loaded (inkjet, transparency film, brochure, and so on). You also get to choose the print quality. A fast draft uses less ink than printing in the best quality. If your printer has more than one tray, you can also choose the source of the paper to use. Borderless Printing: Tell your printer to print with or without borders. You can also select other print options in System Preferences, found under the Apple menu. In the Hardware section of System Preferences, click the Print & Fax icon. You can select the Share This Printer box if you’re willing to share the printer with other computers in your house or office. To check the status of any current printing jobs, click the Print Queue button. One more nice thing about printing on your Mac: The various programs you work in give you lots more custom printing options. For example, you can print a CD jewel case insert in iTunes or a pocket address book in Address Book.